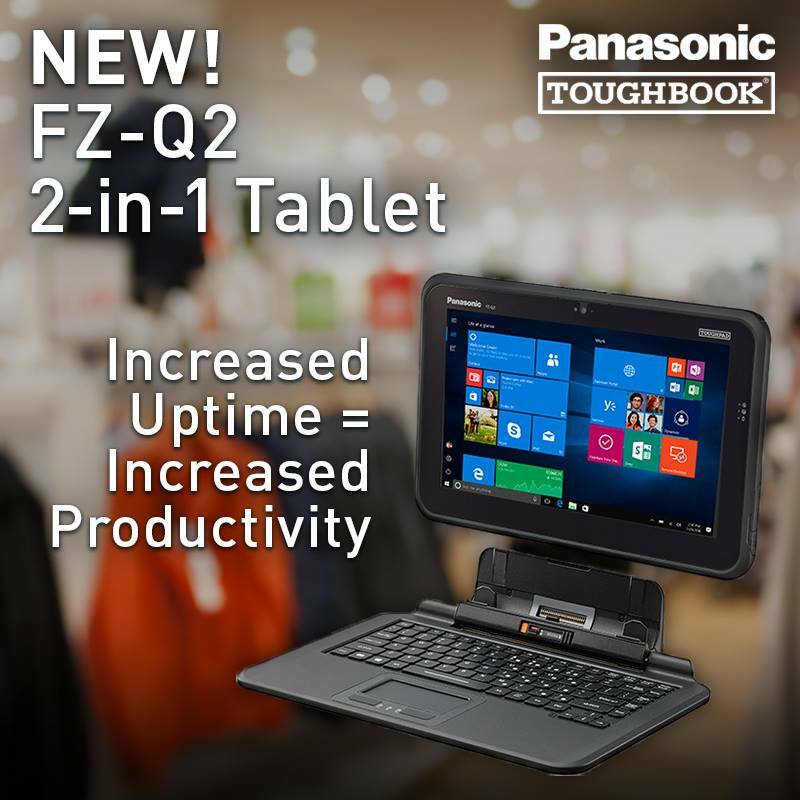 Panasonic Corporation has announced two new additions to its Toughbook family. On Thursday the Japanese company unveiled the new 10.1” FZ-AZ Android Toughpad, an Android 6.0 Marshmallow-powered tablet aimed at enterprise users, along with its new FZ-Q2 2-in-1 Toughpad, which comes with a standard full-sized keyboard and solid-state drive. The Panasonic FZ-A2 tablet in a desktop cradle. The portable FZ-A2 weighs less than two pounds and comes with an 800-nit, 10-point capacitive touchscreen display, according to a Panasonic press release from Jan. 12. The display can be made bright enough to be used both indoors and outdoors in any condition, and can be used with or without gloves. The company also boasts that the tablet, which is available in stores as of Jan. 12 for $2,189 USD (base model), can withstand drops of up to five feet and has a certified IP65 rating for protection from dust and water. In terms of hardware, the FZ-A2 is powered by Intel’s Atom x5-Z8550 processor (2M Cache, 1.44 GHz up to 2.4 GHz) with software encryption “for enterprise-grade security and management features,” making it ideal for use in government, legal, health and other industries with strict privacy requirements. Storage ranges from 4GB to 32GB of RAM, and it comes with an 8MP rear camera. Battery life sits at approximately nine hours. Other features include 802.11a/b/g/n/ac Wi Fi, Bluetooth v4.2 LE, a headset jack, full-sized HDMI output port, USB A 3.0 and USB C 3.1, dual microphones, Micro SD, integrated passive pen and holder, GPS, and programmable front facing buttons. There are also configuration options: customers can choose from an integrated barcode reader, a smart card reader, and additional USB ports, among others. Forklift, vehicle, and/or desktop mounts are also available as accessories. Also aimed at the professional mobile worker, the FZ-Q2 comes with the latest Intel Core m5-6Y57 vPro processor and dual band 4G LTE wireless with satellite GPS. Its detachable full-sized keyboard is backlit, lightweight and spill-resistant, and the entire tablet can withstand dust, drops and vibration – “the most common sources of damage or failure,” according to Panasonic. 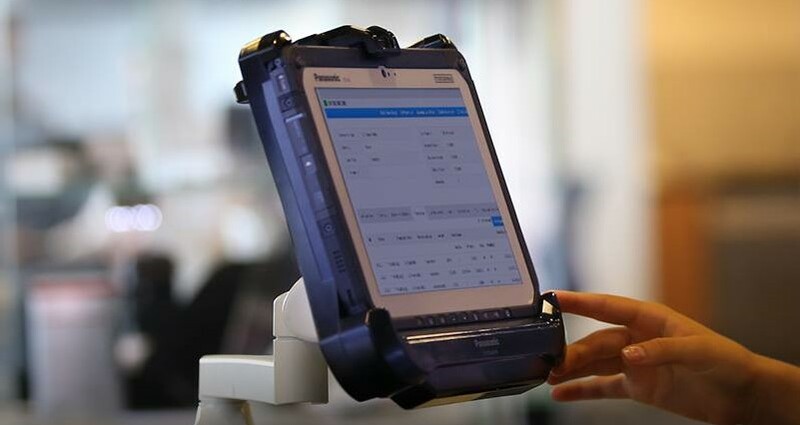 Powered by Windows 10, the FZ-Q2 also features a unique HDMI-input feature for the cable industry and on-site diagnostics, as well as an end-user field serviceable battery to extend the economic life of the tablet. Battery life sits at nine hours, like the FZ-A2. A promotional picture from Panasonic’s Facebook page of the new FZ-Q2 2-in-1 tablet. “With enterprise-grade features like a serviceable battery and 4G LTE connectivity, the Q2 delivers the features that users need and IT and finance operation managers appreciate, ensuring a longer product lifecycle and higher return on mobile computing investments,” Rowley says in a press release. Customizable options include an SSD heater for use in extremely cold environments, and HDMI-IN3. It’s currently available starting at $2,299 USD. Canadian prices for the devices were not available at press time. This smartphone folds in half, but does it matter?